The big drawing card at the April 23 Walt Disney World media event for this reporter was a first look inside Mission: SPACE, the new thrill ride opening next to Test Track, in Epcot's Future World. Reporters were escorted through the attraction, in the company of the Imagineers who designed and are building the ride. The mood for the preview was set by Walt Disney World President Al Weiss, who announced that the attraction would "soft open" on August 15, and would officially open in October (during a soft opening the ride may open or close without notice). Mr. Weiss apologized for the fact that the Press couldn't actually ride the attraction until August 15, but confided that he did have a chance to ride (its good to be President). He reported (with the genuine excitement and delight of a kid) that he thinks this will be one of the greatest attractions in the world, and we don't think he meant just Walt Disney World. The story of Mission: SPACE takes us about forty years into the future, when Disney and space program experts hope that space flight will be routine for ordinary citizens. Guests will become trainees at the International Space Training Center (ISTC). After a quick course in space flight the trainees are briefed on their training mission and embark on a mission to Mars! Theyll experience all the sounds and sensations of a shuttle launch, including high g-forces and some simulated weightlessness. When they come back to Earth, trainees can move on to the interactive experiences in the Advanced Training Lab, or head out back into the bright Florida sunshine. The Advanced Training Lab is also a haven for everyone (including small children) who has bypassed the thrill portion of the ride (all guests, whether they ride or not, must go through the queue and pre-show areas). Reporters were escorted on scheduled, half-hour group tours through the pre-show, loading and post-show areas of the attraction, and got to play with all the post-show hands-on attractions. We were not shown the ride vehicles, but we do have a good picture of the interior of the ride's 40 four-person "capsules" (see photo on right). You've probably seen photos of the outside of the attraction, with its colorful models of Jupiter, a huge, blood-orange Sun, and a spinning planet Earth being orbited by a swooping space shuttle, all embraced by gracefully curving walls. This is Planetary Plaza. Hidden from casual view is a large (approx. 12-foot diameter) model of the moon, prominently marked with the sites of every manned and unmanned lunar landing. It's a fascinating way to visualize humanitys exploration of our closest neighbor. The curving inner walls of the plaza are decorated with plaques holding famous and/or inspirational quotes about space exploration. You walk from the plaza through an archway cut in the bottom of the Sun. Our home star doubles as the rides sheltered entrance rotunda, where you'll view videos of the ride (so you can decide whether to ride or walk on by) and find separate FASTPASS Return, Single Rider, and Standby entrances. We walked through the FASTPASS portal into the first of several pre-show/queue areas, this one dominated by a full-size model of the long-range spacecraft's living area, a large wheel (perhaps 40 feet in diameter) spinning to create artificial gravity, like the Jupiter spacecraft in 2001 a Space Odyssey). This is the Simulation Lab, which also holds a scale model of the entire spacecraft, and a real Apollo lunar rover on loan from the Smithsonian's Air and Space Museum. 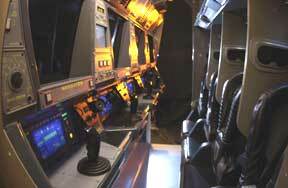 We move from there into Training Operations, a cozy, semi-circular control room. Not only does it represent a training room for the mission's flight controllers, but it's also the attraction's functioning, staffed control center. The cast members you'll see are ride operators, not actors. Next is Team Dispatch, where riders will be separated into groups of forty trainees. Each group will be ushered through one of four color-coded doorways into the Ready Room, where they learn more about space flight and their mission and are assigned to a four-member crew. (All four of the simulator units behind those doorways have identical pre-shows and story lines, so it won't matter to which door a guest is assigned.) Every member of each four-person crew is assigned a role - commander, pilot, navigator or engineer - and each will have responsibilities to perform during the mission. Disney will take pains to keep families and groups together on the crews, and will use the Single Riders line to make sure every crew position is filled. Crews then report to Pre-Flight for last-minute instructions, then take their seats in the capsules. Once in the capsule, each crew will be unaware of the other crews around them. The ride portion of the attraction consists of four separate launch simulators, each one holding 10, four-person training capsules (40 guests per simulator, total capacity of the four simulators 160 guests). 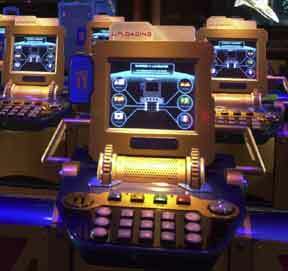 As with Star Tours (granddaddy of all simulator attractions), if one or more simulators are taken out of service the attraction can keep operating with the remaining units. This avoids one of the big pitfalls of nearby Test Track, where a single glitch stops the whole show. As previously mentioned, we werent shown the actual capsules, and only one of the drawings on display gave a hint of the capsules layout. It is clear that the capsules are very small (claustrophobics beware! ), and that there is an over-shoulder restraint system that may be similar to Rock n Roller Coasters. Once the crew has settled in, the totally interactive ride system will respond to each crew member's actions (and mistakes), making every flight different. At times, the g-forces will require trainees to strain to reach for buttons and pull levers, affecting the crews mission performance. Ultimately, though, every crew experiences a successful liftoff and mission - Disney does believe in happy endings. Space Race pits two teams of 16 (12 ground controllers and four crew members) in a race to Mars where time and teamwork count. Each team member stands at his/her own console, and giant display screens show the ships progress as they streak through space. 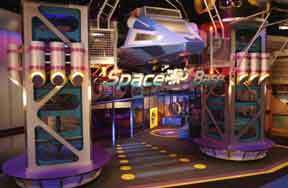 (image (c) Disney) Space Base is a crawl-around exploration environment for those too small to launch. Dad can watch the little space cadet while Mom rockets to Mars (or vice versa). This is a cooler version of the Laughin Place playground at Splash Mountain. Expedition: Mars is a joystick-controlled video game (5 game consoles). An astronaut runs and flies (via jet-pack) across the Martian landscape to find and rescue fellow explorers from an oncoming natural disaster. The game has four, user-selectable levels of difficulty. As with similar games, the graphics on these things just keep getting better. 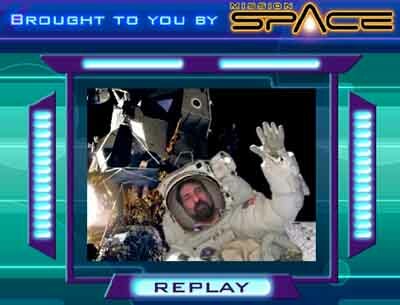 Postcards from Space are a variation on the popular kiosks that insert your video image into an animated scene. You can then e-mail the video postcard to a friend. There are six or eight animated cards to choose from. Heres one of them: Postcard From Space (requires QuickTime to play). Will there be a gift shop and/or photos from the ride? We cant imagine that Disney would skip these vital money-makers, but they werent on the tour, and we forgot to ask. How much time will you spend in this attraction? FASTPASS queue and pre-shows will run about 20-25 minutes. Final simulator ride time has not been selected (story lines are still being tweaked), but it will be somewhere between five and seven minutes. If you play the games in the post-show area you can easily spend another half-hour or more. Altogether, the typical guest will probably spend an hour in this attraction, and some of us, much more. Height: Your best guess. My rough guess is somewhere between 48" and 52". Health: Similar to Rock n Roller Coaster or Tower of Terror. Medically frail individuals and pregnant moms probably should not ride. Wheelchair: Queues, pre-show and post-show are fully accessible to ECV and wheelchairs, but guests will probably transfer from ECV or wheelchair to ride the simulator. Language: On-screen text for Space Race, Expedition: Mars and Postcards from Space is available in six, user-selectable languages (this is confirmed by experience). On-screen text in the simulator capsules may also be multi-lingual, provided all four crew members speak a common language (were only guessing about this last part). And what about motion sickness? After hearing reports about the early human "flight" tests, some folks started calling the ride "Mission: SPEW." However, the Imagineers are quite offended by this nickname, and are confident that theyve solved the motion sickness issues. Still, with the forces involved, wed think folks with inner-ear problems will probably be very uncomfortable. We guess that the physical after-effects will be no worse than Rock n Roller Coaster or Tower of Terror. Altogether, I was very impressed with what I saw. As a space flight geek, Im sure Im going to be spending lots of time at Mission: SPACE, and after Im done, Ill want to head to Kennedy Space Center for even more!